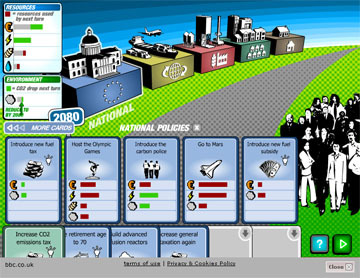 BBC Climate Challenge is an online interactive game that deals with the politics of solving a transnational problem. It took me about 25 minutes to complete the game and admittedly I charged right in for a few rounds before I really gathered what I was doing. The premise is this… You are the leader of your country and you need to make choices about the policies you will enact over several years. Each policy has a cost or a benefit. The cost or benefit categories are : money, food, power, and water. They operate on a sliding scale that goes up and down based on your choices. You select policy cards in each round and once every three rounds you go to an international negotiation to try and establish global CO2 level reduction pledges. For the record, I barely managed to keep my office and I completely THRASHED the British economy… BUT I did hold up my international agreements. Success? It isn’t clear…And that’s the nice part about this game. This is clearly a two-level game with competing objectives. You develop a very strong sense (if you play more than once) of the problem with public approval and managing an economy while trying to keep the world from descending into global climate hell. The game teaches you almost nothing about the global effects of climate change and to be honest I’m thankful. I find many resources about politics and environmental issues have a tendency to highlight the problem of the environment over the problem of the political calculations in dealing with the environment. Students who are reflective about the game will pick up on the sheer difficulty of making policy decisions and calculating the costs and benefits. Additionally, even if I wasn’t interested in getting reelected by my people, I found myself enacting competing policies year over year. I was an absolute hypocrite dealing out water privatization one round and then enacting massive public works projects the next. I think for maximum effect students should be made to play this game at least twice recording their choices and outcomes after each round. The game isn’t flashy, or even exciting… but its points are clear and for this I give it a stamp of awesome.